Another one of my favourite cafes in Sydney and one I visit regularly for breakfast, or lunch. Run by Jared Ingersoll, he believes in slow food movement and practicing sustainable and ethical principles in sourcing raw ingredients to create a more delicious and nutritious cuisine. Dank Street supports the local producers, ensuring quality seasonal produce and minimizing unnecessary transportation and storage. Their garlic bread is famous amongst my friends, we would endlessly talk about how fantastic and delicious they are. 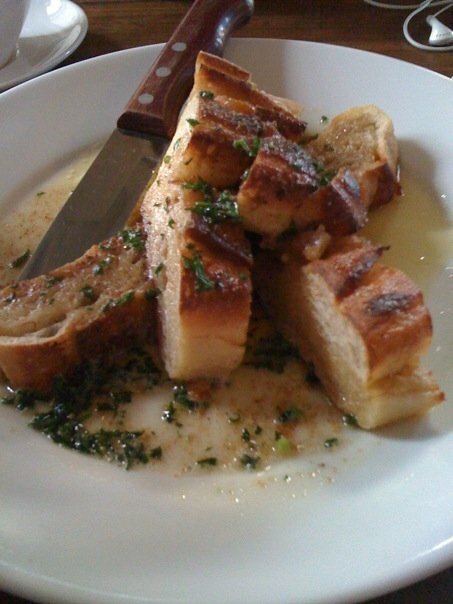 It is not your ordinary garlic bread where they toast two pieces of bread and then smear garlic spread on top of it. The bread, slightly toasted, fresh and moist and lightly drenched with garlic butter and herbs… I have to admit, it was a little oily for my liking but it was tasty! It tasted so SO GOOD that it leaves an impression to most of us who dine here. 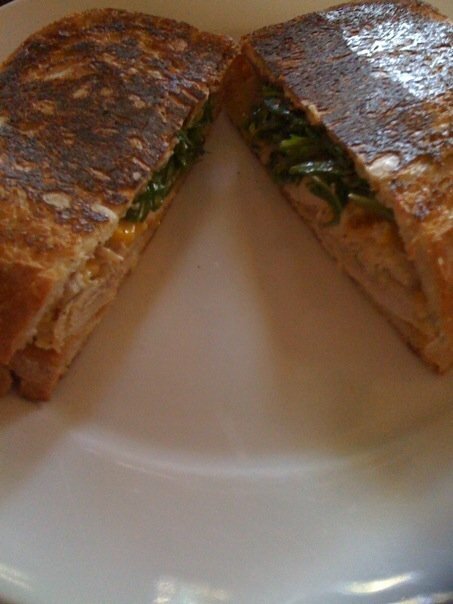 My sister in law had the chicken sandwich – which was biodynamic chicken stuffed and roasted then mixed with roasted corn and mayonnaise, served on rustic loaf with rocket. She had it toasted and the combination the chicken, corn and mayonnaise with rocket is just simply outstanding. The sweetness of the corn and mayonnaise against the bitterness of the rocket – it’s just simply fantastic. It’s simple but yet tasty! I had the special salad of the day – which was tuna nicoise salad with poached egg salad. This salad was light and absolutely delicious. 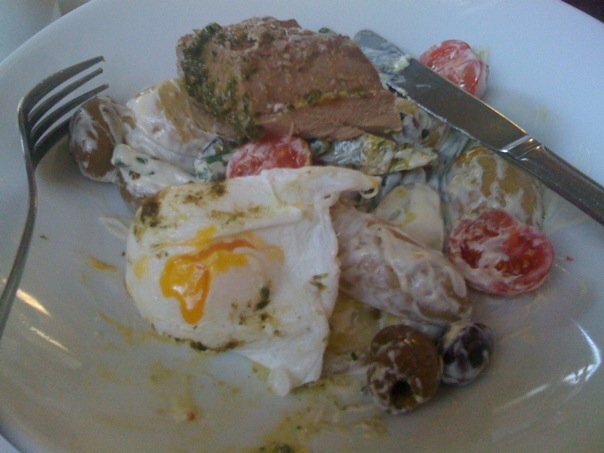 The tuna was seared and tender, the egg was poached and runny (my favourite!) and was served with potatoes, tomatoes and olives with mayonnaise. 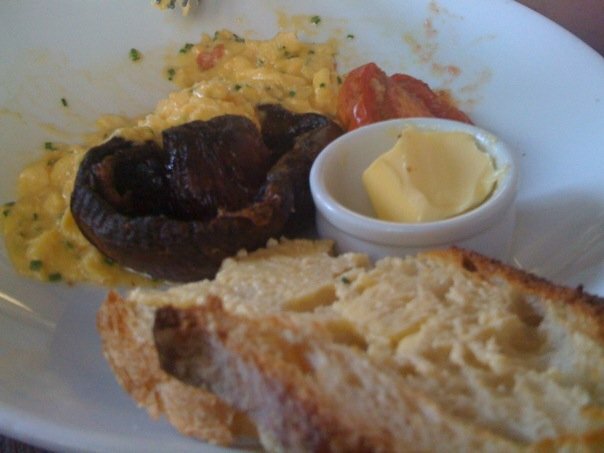 My brother had the creamed eggs with truffle oil – 2 eggs cooked with cream and butter, served soft with chopped chives, truffle oil roasted field mushrooms, herbed tomato and sourdough toast. The eggs were simply too die for – it was so creamy and tasty and you could taste the truffle oil infused in the eggs and mushroom. Come early if you want to have breakfast / lunch – the place does get busy. Its cozy and friendly, it’s a great place to take visitors or simply with friends.